Internationally acclaimed for her powerful portraits of Black women, Brooklyn-based artist Mickalene Thomas (b. 1971) comes to the Art Gallery of Ontario (AGO) this fall with a remarkable exhibition that sparks urgent questions about race and sexuality and how we see the Black female body. Mickalene Thomas: Femmes Noires, which explores Black celebrity culture and Western art history through a queer feminist lens, includes paintings, video montages, silkscreens, photographs and several immersive living room tableaux. Mickalene Thomas: Femmes Noires is Thomas’s first large scale solo exhibition in Canada and will take over Level 5 of the AGO’s David & Vivian Campbell Centre for Contemporary Art. A unique international partnership between the AGO and the Contemporary Arts Center, New Orleans (CACNO), the exhibition opens in Toronto on Nov. 29, 2018. Mickalene Thomas: Femmes Noires is curated by Julie Crooks, the AGO’s Assistant Curator of Photography, in collaboration with Andrea Andersson, The Helis Foundation Chief Curator of Visual Arts at the CACNO. A centrepiece of the exhibition is Do I Look Like a Lady? (Comedians and Singers) (2016), a large scale video installation which features short archival clips of iconic Black female performers from various eras, including Whitney Houston, Nina Simone, Whoopie Goldberg and Wanda Sykes. With acerbic humour and biting critique, this two-channel video projection exposes the weight of being a Black female celebrity in an often fickle and sexist entertainment industry. Another highlight is Thomas’s Le dejeuner dur l’herbe: Les Trois Femmes Noires (2009), a monumental painting that recasts Edoaurd Manet’s iconic 1863 work. In contrast to the two white women in Manet’s work, here three Black women wear funky jewelry and outfits, glamourous makeup and fabulous coiffures. The Black women are centered and stare at the viewer with self-possessed unflinching gazes. This vibrant collage of rich colours, rhinestones and fragmented shapes is a cheeky homage to the original painting while highlighting conversations about race, gender and history. Continuing the AGO’s commitment to exhibit the very best of contemporary art from around the world, and to highlight women artists, Mickalene Thomas: Femmes Noires runs to March 24, 2019. The exhibition will travel to New Orleans in the spring of 2019. This exhibition will be accompanied by a catalogue with contributions by curators Julie Crooks (AGO), Andrea Andersson (CACNO) as well as an essay by Antwaun Sargent and literary excerpts by Alice Walker, Chimamanda Ngozi Adichi, Lorraine O’Grady, Jesmond Ward, Edwidge Danticat and Makeda Silvera. The exhibition is included with General Admission and is free to AGO members. More information on the benefits of AGO membership can be found at www.ago.net/general-membership. Mickalene Thomas: Femmes Noires is organized by the Art Gallery of Ontario, Toronto and the Contemporary Arts Centre, New Orleans. Mickalene Thomas (b. 1971, Camden, NJ; lives and works in Brooklyn, NY) is a 2015 USA Francie Bishop Good and David Horvitz Fellow, visual artist and filmmaker who draws on art history and popular culture to create a contemporary vision of female sexuality, beauty, and power. Blurring the distinction between object and subject, concrete and abstract, real and imaginary, Thomas constructs complex portraits, landscapes, and interiors to examine how identity, gender, and sense-of-self are informed by the ways women and “feminine” spaces are represented in art and popular culture. Thomas’s work is in numerous international public and private collections including The Museum of Modern Art, New York; San Francisco Museum of Modern Art; Solomon R. Guggenheim Museum, New York; Whitney Museum of American Art, New York; Museum of Fine Arts, Boston; Art Institute of Chicago; MoMA PS1, New York; Brooklyn Museum of Art, New York; Studio Museum in Harlem, New York; Yale University Art Collection, New Haven, CT; and Hara Museum of Contemporary Art, Tokyo. Located in Toronto, Canada’s largest city of 5.9 million, the Art Gallery of Ontario (AGO) is one of the largest art museums in North America. The AGO’s collection of close to 95,000 works ranges from cutting-edge contemporary art such as Untilled by Pierre Huyghe to European masterpieces such as Peter Paul Rubens’s The Massacre of The Innocents; from the vast collection by the Group of Seven to works by established and emerging Indigenous Canadian artists; with a photography collection that tracks the impact of the medium with deep holdings of works by artists such as Garry Winogrand and Diane Arbus; and with focused collections in Gothic boxwood miniatures and Western and Central African art. Drawing on this collection—as well as collaborations with museums around the world—the AGO presents wide-ranging exhibitions and programs, taking special care to showcase diverse and underrepresented artists. A major expansion designed by Frank Gehry in 2008 with lead support from the family of Ken Thomson makes the AGO a highly-photographed architectural landmark. 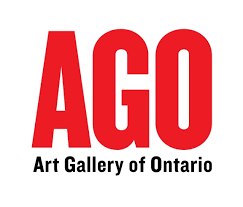 Visit ago.ca and follow @AGOToronto to learn more.